Going back to the PEv2 days, there was a PM thread going on in 2010 about this "nektar" of the gods. This was about the time I was first getting seriously into it. We started another PM thread in 2011 that went on quite a bit with interesting discussion for about 18 months. We tried carrying on this discussion at PEv3 when we migrated here, but it didn't get much beyond the first few months. As such, we haven't really been discussing it for the better part of 4 years. So I thought it might be best to get this started again on the main boards since the Groups never captured the magic of the old PM threads. Here is the initial post I made in the 2011 thread to kick things off. I chuckled when I read it because my tastes have evolved since then. But I thought it might be a nice kickoff to launch this thread. So what have you been enjoying lately? Subscribing so I check this out later. A friend from out of town stopped by last night. He travels to Asia quite a bit for work and he brought a bottle of Korean whisky called Calton Hill. We inspected the fine print and it was a Scottish blend. Not too bad really. Then we switched to The Balvenie 15. Aye, there's a proper dram. We were in Scotland last year and obviously sampled a lot of single malt whiskey, even toured a small boutique distillery and saw how it was made and stored. I'm not a great expert on whiskey, but I learned a lot while I was there, including how to add a bit of water to really bring out the taste and cut some of the burn. I'm not a super big fan of the peaty style, so my tastes ran toward Speyside rather than the islands or Islay. I can't put my finger on a specific maker, but would be open to recommendations. Oddly, my favorite single malt isn't Scottish at all, but is Welch, Penderyn. I've never tasted a whisky like it and I absolutely love it. It may be surprising with my childish, unsophisticated ways, but I do love me some scotch. By far my favorite that I've had is Laphroig. Just love that peaty goodness. $$$ though! My wife bought me some of that Ardbeg Ten and I liked it quite a bit. My "go to" whisky is Highland Park, from Orkney...in fact I think I'll "go to" the kitchen right now and pour myself one! Haven't bought a bottle of single malt in quite a while, but I've noticed some new ones in the store lately that I'm a little curious about. But my favorites are Lagavullin and Caol Ila. Both pricy though. I like Laphroig and Ardbeg too though. Those peaty ones are my favorites. There used to a store in Manhattan that somehow had Lagavullin for like $45 as opposed to the usual $80 or so, but I'm pretty sure it closed. Last year we splurged and bought a 30-year-old Ben Riach. Oh, man oh man. Is that ever good. Best tasting Scotch I've ever had. No bite at all. We made that bottle last almost a year. Not really a scotch drinker anymore. Honestly, I find the taste TOO addictive. However, when I retired a year or so ago, one of my friends bought me a bottle of this. I did have a couple of drams...and yes, I loved it! I don't drink nearly as much scotch I used to, as I am more of a micro brew kind of guy. Once a year though, I splurge on a bottle . I just opened a Lagavulin Double Matured that I bought with my Christmas bonus. It'll probably last me through to the next holiday season. If funds permit, acquire a bottle of the 18 year old. It is exquisite. Currently I have a bottle of Lagavulin on it's last legs, and a Tomatin 18 year old about half empty. Also, the dregs of a Mongo-big bottle of Glenmorangie--bottle is too big for my liquor cabinet, so it stays on the floor! My favorites are Ardbeg, and Highland Park....but I like 'em all well enough. I especially love Cask Strength bottles. Typically distilled in areas with a lot of peat (boggy ground with lots of moss, heather and water). The malts are dried over peat fires that resulting in a smokey tastes to the whisky. Almost finished with a a bottle of Macallan 12. Will probably buy Highland Park 12 next. This is correct. 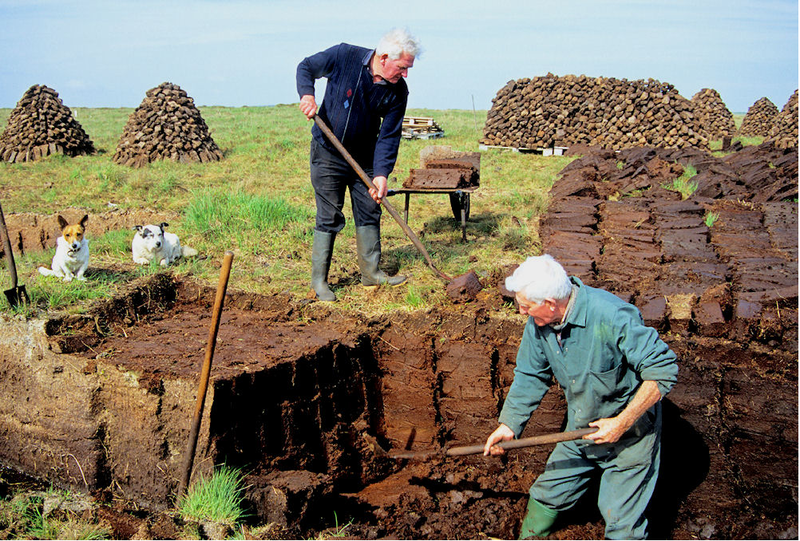 Here are some photos from the distillery that I visited, one of which shows the actual peat which is used for the fires that toasts the grain. They actaully let us taste gran that was peat toasted and some that was not. It's amazing how much of that "peaty flavor" is already present in the toasted grain, long before distilling. I think I saw them play at Big Ears festival a couple of weeks ago.